NASA reports that the New Horizons spacecraft, now less than 10 days from its fly-by with Pluto, experienced an “anomaly” that resulted in a loss of communications on Saturday, July 4th at 1:54 pm EDT (17:54 UTC). Communications were reestablished a little over an hour later at 3:15 pm EDT (19:15 UTC) but the spacecraft has automatically put itself into “safe mode” because of the anomaly. NASA teams are working on a recovery plan but because the spacecraft is almost 3 billion miles (4.9 billion kilometers) from Earth there is an almost 9-hour round trip communication delay. Because of this delay a full recovery could take several days (see original press release). The trajectory image above shows the spacecraft approaching Pluto at an acute angle at a distance of 0.07 AU or just over 10 million kilometers. In a plasma universe it is theorized that electric charge differentials can build between such approaching objects. Eventually this build up results in a discharge that can not only disrupt delicate spacecraft electronics but can also affect the Sun’s magnetic field and particle output billions of miles away. A quick check of solar wind and magnetic field fluctuations for that time period reveal that indeed there was a significant change in activity in the time leading up to, during, and after the communications loss with the New Horizons spacecraft. The following image shows three days of graphed observation data from NASA’s Advanced Composition Explorer (ACE) satellite currently in a Lagrange orbit between Earth and the Sun. The white vertical line was later added and marks the date and time that communications with the New Horizons spacecraft were initially lost. 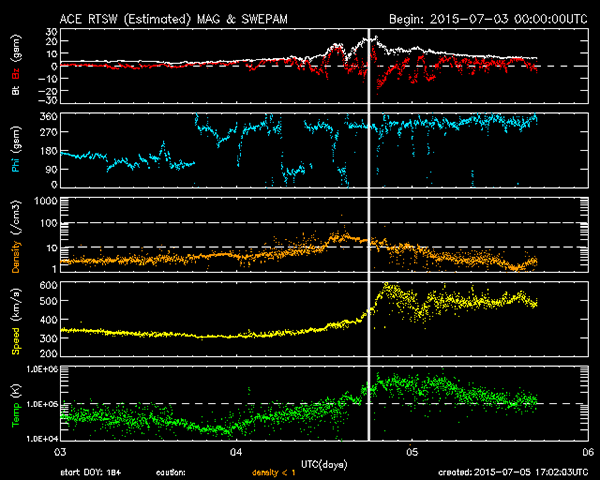 The orange line indicates a coronal mass ejection (CME) occurred just a few hours before the spacecraft anomaly. The white and red lines indicate that concurrently there was a spike in magnetic field intensity and direction that continued to build to the point when communications were lost. The yellow and green lines show an increase in solar wind speed and temperature shortly after the anomaly was detected. Is there a relationship between the malfunction aboard this spacecraft and the sudden jump in solar activity? A single example such as this could easily be dismissed as coincidental, especially with the cause of the anomaly still under investigation. However there are actually several examples of object convergence, man-made or otherwise, that have been accompanied by changes in solar activity, including changes that have impacted both planets and spacecraft in the solar system. Some of these additional examples will be examined in future posts. If such a correlation could be established it would be further evidence of a solar system greatly affected by electromagnetic forces and a universe dominated by them.